There’s no doubt about it: Onstage Atlanta, the area’s premier semi-professional theater company, chose an opportune moment to stage John Patrick Shanley’s Doubt: A Parable. President Barack Obama’s recent statement in support of the concept of gay marriage (following the passage of an amendment in North Carolina defining marriage as a union between a man and a woman) has again raised the thorny issue of how we regard the gay men and women in our ranks. Shanley’s simmering play doesn’t address gay marriage, but its conflict between stern, unsmiling Sister Aloysius, principal at St. Nicholas Church School, and charismatic Father Flynn reaches its apex with a confrontation regarding Flynn’s sexual proclivities. Certainly, the tensions between the two are informed as much by differences in generation and temperament as by Aloysius’ suspicions concerning the nature of Flynn’s close relationship with a young African-American student. The beauty of Shanley’s play, of course, is that we never know whether Aloysius’ implications are justified, just as we’re not sure whether she believes them herself. In either case, the old-school nun’s willingness to hint at an unsavory tint to Flynn’s relationship with the boy can be seen as an illustration of just how easily any sign of “difference” can be extrapolated into something far darker, and how ready some people are exploit fear of those differences for personal gain. Although it’s set in 1964, Doubt: A Parable remains all too timely. 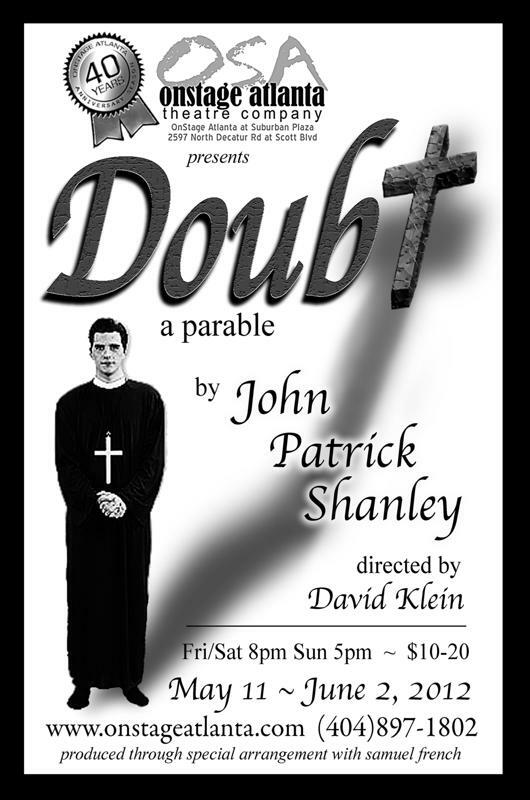 Doubt: A Parable runs through June 2 at Onstage Atlanta. 404-897-1802. www.onstageatlanta.com.